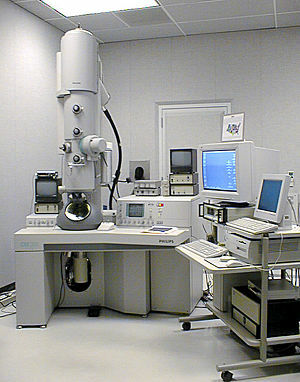 Transmission electron microscope (TEM) capable of producing images with sub-angstrom resolution. An electron microscope is an electron-optical instrument in which a beam of electrons is used to produce an enlarged image of a minute object on a fluorescent screen or photographic plate. Electron microscopy is used when items or features are too small to be imaged by light. In this case, the image is created by the bending/reflection of an electron beam rather. It can magnify very small details with high resolving magnifying at levels up to 500,000 times. The transmission electron microscope is much like the light microscope, but generates in image by sending an electron beam through a very thin slice of the specimen. The resolution limit is around 0.05 nanometer. A human leukocyte (white blood cell) of the type Eosinophil. Golgi apparatus in a human leukocyte. Cross section though a soybean root nodule. The scanning electron microscope is used to produce images with a characteristic three-dimensional quality. The method is for determining the surface structure of a solid by measuring the angle and energies of electrons scattered by the atoms on the surface of a sample. White blood cell, platelet, and red blood cell. Adult Black Fly (Simulium yahense) with parasite. Bread mold (Penicillium chrysogenum) produces the penicillin antibiotic. Salmonella bacteria (red) invading cultured human cells. Pollen from a variety of common plants. Compound eye of the Antarctic krill Euphausia superba. Cilia on lung trachea epithelium. Yellow mite (Lorryia formosa), commonly found on citrus plants. SEM micrographs of four benthic foraminiferans. Scanning Electron Micrographs of Diatoms. pollen from Ipomea purpurea (Heavenly blue morning glory). Sildalcea malviflora (prairie hollyhock) pollen. A nerve ending broken open to reveal vesicles (orange and blue) containing neurotransmitters (chemicals used to pass messages in the nervous system). HIV-1 budding from cultured lymphocyte. Multiple round bumps on cell surface represent sites of assembly and budding of virions. Fairy shrimp nauplius larva (about 7 hours old). Lactobacillus brevis bacteria, which are involved with lactic acid fermentation. Streptococcus suis bacteria. A common pathogen of pigs. This page was last modified on 16 September 2012, at 18:25.